Tonight the tide is turning; the light will return after the darkest night on the northern hemisphere and then Christ of course is born. What could then be more suitable, than to publish a short essay by David Blocker on the trustworthiness of Church father Eusebius – who after all lived in the period when the winter solstice was associated with the Birth of Christ. Eusebius Pamphili () is the source of much of our knowledge of the history of early Christianity. It is necessary to ask if he was an accurate and unbiased reporter. In at least one instance it can be demonstrated that Eusebius allowed his Christian beliefs to influence his description and interpretation of an object he recorded for posterity in his Ecclesiastical History. Eusebius stated that there was a statue of a man and a kneeling woman in Caesarea Philippi (). The existence of the statue was confirmed by three other ancient authors (). The statue was in a state of disrepair when it was first noted in ancient chronicles. It was later moved into the sanctuary of a church in Caesarea Philippi and was finally destroyed at the order of the Emperor Julian (). The Statue Which the Woman with an Issue of Blood Erected. Since I have mentioned this city () I do not think it proper to omit an account which is worthy of record for posterity. For they say that the woman with an issue of blood, who, as we learn from the sacred Gospel (), received from our Saviour deliverance from her affliction, came from this place, and that her house is shown in the city, and that remarkable memorials of the kindness of the Saviour to her remain there. For there stands upon an elevated stone, by the gates of her house, a brazen image of a woman kneeling, with her hands stretched out, as if she were praying. Opposite this is another upright image of a man made of the same material, clothed decently in a double cloak extending his hand toward the woman (). At his feet, beside the statue itself, is a certain strange plant, which climbs up to the hem of the brazen cloak, and is a remedy for all kinds of diseases. They say that this is an image of Jesus. It has remained to our day, so that we ourselves also saw it when we were staying in the city () (). Eusebius stated that the statue was of Jesus and the hemorrhaging woman, when in fact the statue was of Hadrian in the Judea Capta style (). The principle figure was the bearded Emperor Hadrian dressed in a Roman toga, accepting the submission of a female figure representing Judea. 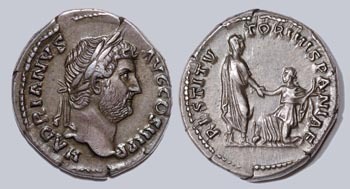 Similar imagery had appeared on the coinage Hadrian had issued to commemorate his tour of other provinces (). 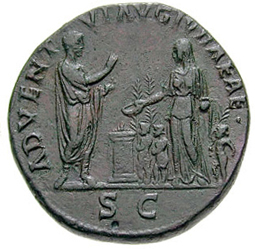 The coins that celebrated his arrival or “Advent” in a province, showed Hadrian accepting the greetings of a standing female figure. The coins issued after his departure commemorated his legislation that benefited or “Restored” the province. They showed a standing Hadrian accepting the gratitude of a kneeling female figure, who usually held an object associated with the province. Most of the coins showed the kneeling figure as resting on one knee. In the case of Judea, the female figure representing the province held palm branches and was accompanied by additional figures of small children. No other coins issued by Hadrian had the Provincial figure attended by children. The children probably represented either the regrowth of Judea following the devastation of the First Jewish Revolt, or were symbolic of a new generation of Judeans loyal to Rome. Examples of Hadrian’s coins are shown below. Note that the image of Hadrian and the female symbol of the Province closely resemble Eusebius’ description of the statuary group that stood in Caesarea Philippi. The second Jewish revolt is though to have occurred between the issuing of the first or “Advent” set of coins, and what would have been the second or “Restoration” issue of coins. This made the kneeling figure of Judea represent “Judea Capta” () rather than a Judea offering her thanks for Hadrian’s visit and his generosity. The coins of Hadrian with the kneeling Judea lack the word “restore” which was present on the coins issued in other provinces. This suggests the Judea figure was kneeling not in gratitude, but in submission and defeat. Hadrian’s Judea Coinage, Advent and the Restitutor Type without a caption (). The statue as described by Eusebius, was clearly a statue commemorating the Roman subjugation of the rebellious Judeans. It showed Hadrian looming over the conquered figure of Judea. Furthermore, Eusebius was also credulous enough to assign miraculous qualities to a plant that was supposedly growing on the statue. One has to wonder if there was an actual plant growing on the statue, or if Eusebius was fancifully describing the carved palm branches, that were also represented on Hadrian’s Judea coins. Eusebius concluded that a statue of the Emperor accepting Judea’s submission following the brutal subjugation of the Second Jewish Revolt, was actually a statue of Jesus performing a miracle. He also stated that the statue had miraculous healing properties. One has to ask if Eusebius was merely credulous and unquestioningly accepted everything he was told by his sources, or if he consciously or unconsciously assigned a Christian significance to what he saw. One has to ask if Eusebius was deliberately trying to mislead his readers into believing that that he had actually seen a bronze statue of Jesus in Caesarea Philippi. The fact that Eusebius did misrepresent a statue of a Roman Emperor as a statue of Jesus means that his accuracy, reliability and possibly honesty as a historian is suspect. Other assertions he made in Ecclesiastical History must be carefully assessed before they can be accepted as the unvarnished truth. Eusebius of Caesarea (c. AD 263 – 339) also called Eusebius Pamphili, was a Christian polemicist. He became the Bishop of Caesarea about the year 314. He wrote several works including the Ecclesiastical History, a pious account of the first 300 years of the Christian Church. He was a supporter and a favorite of the Emperor Constantine. Eusebius, H. E. vii, 18. Sozomen (H.E. v. 21); Philostorgius (Hist. Eccl. vii.21); Asterius of Amasea (Conc. Nic. II, Labbe, vii 210), in A Dictionary of Christian Antiquities, William Smith and Samuel Cheetham, editors, Little, Brown and Company, Boston, p878, 1875. “…On a tall stone base at the gates of her house stood a bronze statue of a woman, resting on one knee and resembling a suppliant with arms outstretched. Facing this was another of the same material, an upright figure of a man with a double cloak neatly draped over his shoulders and his hand stretched out to the woman.” From Eusebius, History of the Church, translated by G.A. Williamson, Dorset Press by arrangement with Penguin Books, 1984, p.302. This translation depicts a statue that even more closely resembles the image on Hadrian’s coins, than does the older Schaff/Wace translation given in the body of the text. Eusebius, Ecclesiastical History vii, 18; from, A Select Library of Nicene and Post Nicene fathers of the Christian Church, Second Series, Philip Schaff and Henry Wace, Volume 1, Eusebius, Church History, p 304. Note that even though this is but a very short translated excerpt from the writings of Eusebius Pamphili, it contains at least two phrases: “think it proper” and “remain to our day” that have analogues in the so-called Testimonium Flavianum (Flavius Josephus, Antiquities of the Jews, 18.3): “think it proper” /”if it be lawful”, and “remain to our day” /“are not extinct at this day”. “Judging by the analogy of many coins, the memorial had been erected in honor of an emperor (probably Hadrian), and falsely interpreted by the Christians, perhaps on account of a σωτῆρι (soter/Saviour) or θεῷ (theos/god) appearing in the inscription. There can be no doubt of Eusebius’ honesty in the matter, but no less doubt that the statue commemorated something quite different from that which Christian tradition claimed.” Gieseler, Eccles. Histo.. Harpers ed. 1.p. 70, from footnote on p.304 of A Select Library of Nicene and Post Nicene Fathers of the Christian Church, Second Series, Philip Schaff and Henry Wace, Volume 1, Eusebius, Church History. Larry J. Kreitzer, Striking New Images, Roman Imperial Coinage and the New Testament World, Sheffield Academic Press, 1996. See descriptions of Flavian “Judea Capta”coins, and Hadrian’s coins showing grateful provinces accepting his rulings. The 1st century Flavian dynasty had issued a set of Judea Capta coins which celebrated their victory over Judea in the First Jewish Revolt (66-72 C.E.). These coins typically showed an armored Roman standing over a cowering or dejected female figure of Judea. Image from Larry J. Kreitzer, Striking New Images, Roman Imperial Coinage and the New Testament World, Sheffield Academic Press, 1996, p.176. Talking of the reliability of Eusebius I also strongly recommend all blog followers to read footnote #157 in Roger Viklund’s treatise on Josephus Flavius and Testimonium flavianum (https://rogerviklund.wordpress.com/2011/03/19/the-jesus-passages-in-josephus-%E2%80%93-a-case-study-part-2n-%E2%80%93-%E2%80%9Dtestimonium-flavianum%E2%80%9D-the-church-fathers%E2%80%99-knowledge-the-syriac-and-arabic-translations-the-common/). And here is what The Catholic Encyclopedia (1913) tells us about the same legend of Abgar: http://en.wikisource.org/wiki/Catholic_Encyclopedia_(1913)/The_Legend_of_Abgar . I think it’s highly justified to ask if a person who believes in that sort of rubbish may be insane or at least suffering from a delusional disorder. Eusebius the historian – I say: Pooh-pooh. Thumbs-down. The identification of the woman as Berenice the sister of Marcus Agrippa would suggest that the statue is older than Hadrian and dates instead to the end of the first Jewish revolt.